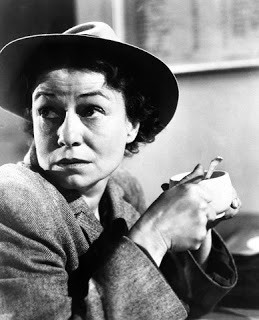 The plot of this mistitled little gem: Ellen McNulty (Thelma Ritter) is a widow whose hamburger stand has gone bankrupt. She embarks on a long journey to visit her son Val, whom she and her hardworking husband were able to put through college. Val is a low level white collar manager (John Lund) trying to impress the big boss so that he can get ahead. After Val meets cute with the ravishing Maggie Carleton (Gene Tierney), daughter of a wealthy ambassador, the two fall in love and a wedding is quickly arranged, coincidentally on the day that Ellen is to arrive. But before you can say “screwball comedy” the young bride mistakes her dowdy, working class new mother-in-law for a maid, and the mother decides to play along, moving in to the new couple’s apartment! Roger Ebert used to point out how few Hollywood films take work and household budgets seriously. In the movies, single mom cocktail waitresses have huge apartments in Manhattan, architects are obligated only to look at a drafting board in their den in the evening rather than go into an office, and no one is every shown paying their electric bill or doing their taxes. The Mating Season is a welcome exception to this rule, as Ellen works out how to deal with her failing hamburger stand, hitchhikes to save on travel expenses, scrambles for the money to pay her bills (including having to work for two days as an office temp for “Mr. Pinchbottom”), finds affordable-but-tatty lodgings and otherwise scrimps and saves. Throughout Ellen’s struggles, the film appropriately portrays as noble her and her husband’s ability to have afforded college for their son despite their modest means, rather than being condescending toward the aspirations that millions of post-war working class Americans shared.